The Grosvenor G Casino in Cardiff might not be the most conventional or stylish when it comes to the décor. It has a mixture of contemporary design on the outside with more classical features on the inside. But somehow it is one of those things that instantly make you like a casino. Cardiff is on the western coast of the UK - where it is the home of a beautiful city centre and interesting nightlife. The modern Grosvenor Casino in Cardiff is dedicated to offering the best in terms of service and games for gamblers of all ages. The casino is easy to find in the Red Dragon Centre - a short drive from the centre of Cardiff. You can also make your way here by using the public transport system if you feel like having a drink or two when you gamble. Food and drinks is a big part of what this casino has to offer - and combining this with great gambling is always a recipe for success. The casino is open 24 hours a day, seven days a week - however, live gambling is only allowed around the clock on Friday, Saturday and Sunday. Outside of these days you will have to live with live gambling from 2pm to 7am. The gambling floor at the Grosvenor G casino in Cardiff is quite impressive - especially if you look at the size of the city and the casino itself. Gamblers will find numerous tables that offer American Roulette and Blackjack. Alongside this the casino offers a decent amount of electronic gambling machines. Slot machines make up a big part of what this casino is all about - with games such as Cleopatra and Lucky Lady's Charm being two of the favourites for gamblers. The layout of the gambling floor is on that is similar to most other Grosvenor casinos, with the tables being right at the heart of the room and slots flanking the walls to maximize the amount of space for gamblers. Poker plays a huge part in what this casino has to offer - with the Poker part of the casino being one of the highlights during our visit. The Grosvenor Grill restaurant might seem like an endless cliché if you have read any of my other reviews of Grosvenor casinos - but it is there for a reason. This excellent dining facility in Cardiff offers diners and guests some of the best food available. By its name alone it is quite easy to guess what type of food is on offer for gamblers. Sirloin steak, rib eye steak and fillet stake are used handsomely to create some of the best grilled dishes that you will west of England. One of the nicer features of the restaurant is the other grilled dishes on offer - including grilled Sea Bass, Salmon and Pork. These dishes are complimented by a few curries, and vegetarian dishes to make it a very comprehensive menu. One of our favourite areas of this casino is the casino bar - a place where gamblers can relax and cool down after a long day of gambling. Some people might just need a break and with its great selection of cocktails, beers, wines and spirits there are few better places to go for a drink than the Casino bar. Welsh football is on a march to the top (or near the top) and if you want to follow your favourite sports team then the sports bar is the perfect place to do so. Most major international events are displayed every week and it is a perfect place to catch a break from the lively gambling floor. The headline for this casino could just be "Poker" - because that is what they mainly aim to promote. However, this is not a bad thing as most gamblers love a good game of Texas Hold 'Em - mainly because you have much more say in what happens with your money. The daily Poker tournaments have a total of £5,000 in guaranteed prize money spread out across the week. The casino claims to have the best card room facilities in all of Wales and until we have seen better I am inclined to agree. With the Playpoints the casino rewards you for your loyalty. You will earn these points every time you play a game, have a meal or go for a drink at the bar. These points can be exchanged for gifts, cash, food and drinks when you have accumulated enough. Other than this a lot of focus is put on the live sporting events that are broadcasted in the bar. A big screen is also available in the Poker room where some of the most exciting Poker action from around the world is broadcasted. 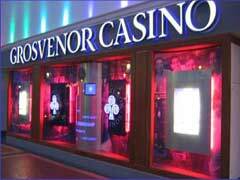 Why Grosvenor G Casino Cardiff? Grosvenor G Casino in Cardiff is a venue that I will gladly visit again. Most of its facilities are top of the range - and with few other options in Cardiff and Wales - there is not really a better place to gamble at the moment. The range of games that they offer is good, and when you add the large Poker section it just becomes better. If you are looking for a good night out, a bit of entertainment or just a bite to eat then the casino can cater to all your needs. Grosvenor G Casino in Cardiff really is a complete entertainment package for locals and tourists alike.